I remember a quote from GM last year telling us how, this time, the Chevy and GMC we going to be much more different from each other. Well.... I don't see it. They are again the same cars with different front ends. 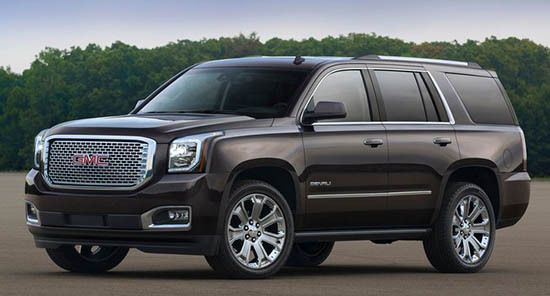 Which is pretty sad, Which also means that, again, the Escalade will just be a Chevy with a Cadillac front. 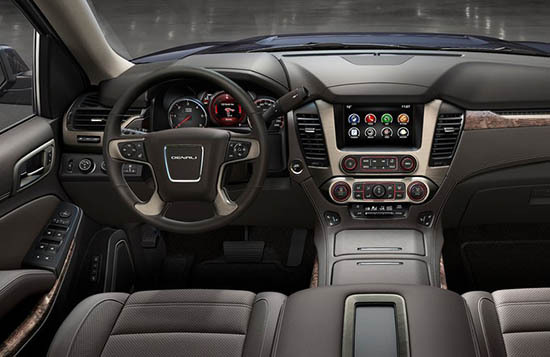 Inside, at least, it is not like the 2014 Chevy trucks. But look! The column shifter is still there! In a 2015 model. I guess GM doesn't really care, since they keep selling tons of these every year. Over 100 000 of them last year alone. 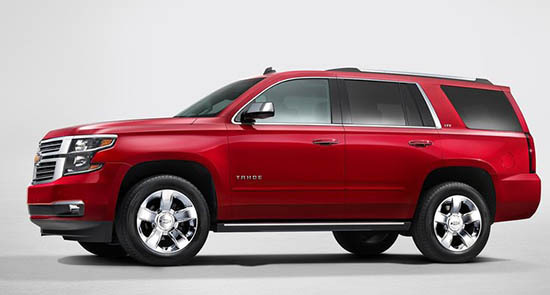 Without including the Suburban and its Yukon KL twin. So, I guess they're right... Why bother making these modern and different from each other. Just like the pickups, they now share MORE in common than before. But that's not my problem here, my problem is that the Chevrolet front end is repulsive. The GMC is not much better. If the pair doesn't receive an emergency refresh, like the Malibu, I will be shocked. I want to really, really, really rant about how awful these are (I'm a lifelong GM supporter/owner/enthusiast and feel I have every right), but I don't want my thoughts censored (they are THAT bad, IMO). Terrible, just terrible, GM. I absolutely will not own one of these (nor do I expect to purchase one of the new extremely slow-selling pickup disasters), I will tell you that. /end mini-rant. I absolutely DO want a column shifter though, Vince. They free up space!!! And, I personally don't even want a center console (a bench, with a folding center armrest, and some cupholders mounted low on the floor/to the bench is ideal for me and my long legs). Now, the option to have a floor shifter would be nice. (What would it really cost to do that, a hundred dollars or two?) The Escalade absolutely must have a floor shifter, though. I think youre both crazy.... I didnt have extremely high expectations.... But i think these both look great!!!!! I like the GMC. It's understated and nicely styled. But the front clip of that Chevy, wow. It's the nastiest reincarnation of the Family Truckster I've seen. 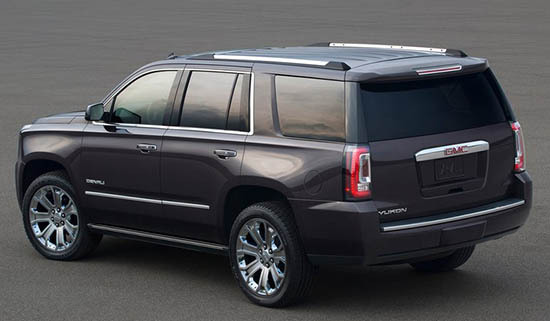 I assume the Yukon is going to share front fenders with the Escalade again, as that headlight shape is VERY Cadillac. Look great but the headlights on the chevy look like a cheap chinese design, big fail! The Chevy is even uglier than before! The Yukon looks fine, but the side profiles of both are disturbing. I also see that the Caddy fenders will be shared because the headlight shape is showing us what the front of the Escalade will pretty much be, minus longer headlights. They look terrible, both of them. Also, why in the hell would GM add Cadillac's signature headlamp drip (for lack of a better description) to the GMC? GM is such a piss poor company in many ways. They always disappoint me, of course not including the C7. What the... With ALL the super-surprisingly-great designs GM's been giving us as of late: REALLY?!! Would it really have been too TOO hard even, to slap a back, n a little more side "blingage" (eye candy) on the Silverado n Sierra duos? From the fronts, to the sides, to the rear angle view (qtr panels), this thing like BAD!!!!! No finesse at all. They look like generic boxes. The interiors are nothing special either. The GMC is a little better than the tragic Chevy. GM has proven that they can create great, artful, smart designs. Why not here? What we see here are conventional, lazy designs. I truly hope that Cadillac won't be a carbon copy of these. It is! I just saw some new pix of the Escalade. It has the exact same body. And also the column shifter! Same thing over and over. 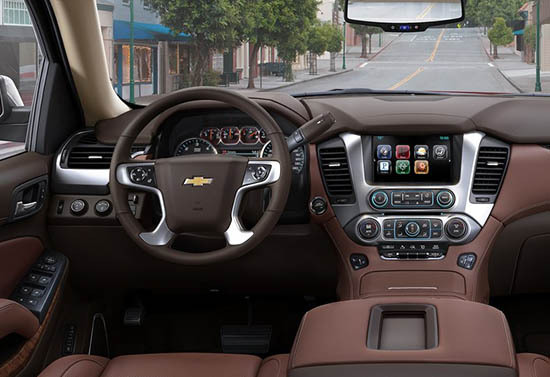 Again, the Escalade is just a Tahoe with a Cadillac front end and dashboard. Like the exterior; interior is a big disappointment. Liked the old interior better--it seemed more upscale than this. Why no wood??? In a $50k Merc or BMW X5 I get REAL WOOD and LOTS OF IT! Are they dropping the price of these or is this just an oversight??? Come on!!! Now were comparing these to a Merc/BMW?!? ITS A CHEVY! It's a CHEVY. A $45k-$55k Chevy. Yes, we're comparing it to $42k-$55k Mercs & BMWs. I think the profile, especially the C pillar with the sharp chrome corner details, looks like the outgoing Lincoln Navigator. Also very surprised by all of the negative comments on here. Before hating them so much, keep in mind what these vehicles are and the market they intend to serve. These vehicles will be a huge improvement to the current line up, that is already far superior to the competition. I was able to see the fleet in person and they really look great, press photos do not do them justice. They look much more athletic than the last generation, which always looked slightly bloated to me. I am most surprised by the comments about the interior. Materials were great, although there is less wood on the dash itself (the real aluminum is nice), there are wood bands alond the sides of the seats which much more present when you are in the car than the photos show. And the column shifter?!? I currenlty have this on my Silverado and really like it. Feels great and frees up space on the center console.